Dealing with an emergency flood cleanup isn’t fun but as residents of Gainesville know, Florida weather can be tricky. If you suddenly find your home invaded by inches of water, it’s important to take action quickly. Water damage happens over time, but it begins the moment your possessions get wet. Therefore, you should begin the process of cleaning up as soon as possible. If the damage is extensive, be sure to call in a water restoration company to assist you in the task of cleaning and sanitizing. What Should You Do While Waiting for Emergency Flood Cleanup? Now that you’ve made the phone call to ask for help, what should you do while you wait for the professional water restoration technicians to arrive? 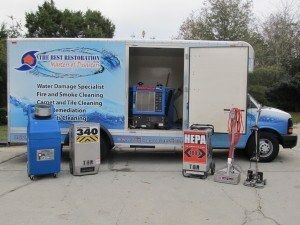 Since you’ll have to wait until the service techs arrive, take the time to eliminate as much of the water as possible. Doing so will help to prevent more damage from occurring while also enabling the area to begin the drying process. You can also move items out of the water, placing them in a drier location. Since water is involved, it is important not to use any electricity in the flooded area. The safest measure to take is to turn off the power going into the rooms where flooding has occurred. If any of your electronics have water damage, you should unplug them once the power has been turned off and move them to higher ground. You should avoid walking in the water unnecessarily, and you should wear boots whenever you do. Pollutants can get in the air, so you’ll want to avoid being in the rooms where the flooding has occurred. During your emergency flood cleanup, keep the windows open and use fans to circulate indoor air to the outside of your home. Homeowners who expect to put in a claim with their insurance company should take the time to document the incident. You can photograph the area or take a video of it to show the extent of the damage. If you are not covered for flood damage, you won’t be able to put in a claim.